Menswear isn’t as spontaneous as women’s and I think men silently envy us for this reason. It sort of follows a strict and dare I say it, boring formula with a few exceptions here and there. 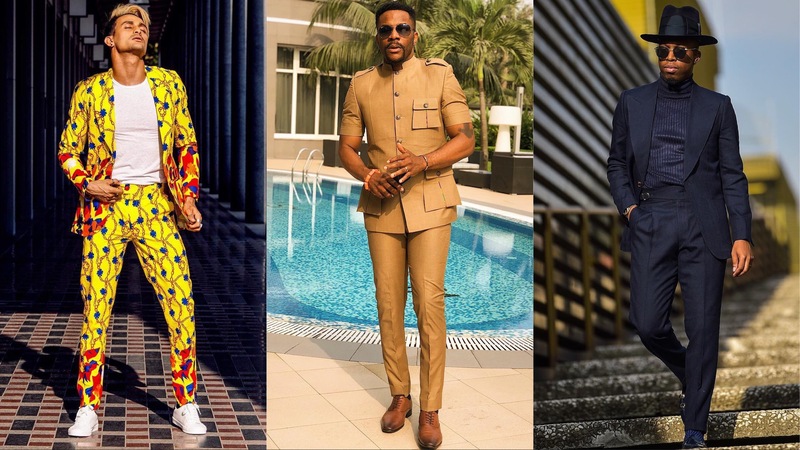 Thanks to Lagos Fashion Week 2018 and the recently concluded men’s fashion week, we have taken notes of the looks and accessories that will be making waves in menswear in 2019. If you’re a dapper man looking to up your style game this year, this selection will certainly inject fresh energy into your wardrobe. There’s something powerful and attractive about a man in uniform which is what Mai Atafo channelled into one of his latest collections as seen during Lagos Fashion Week. Many Nigerian designers have tapped inspiration from this military cut and we expect this look to continue trending throughout the greater part of 2019. Hats and caps are a thing – a major thing. There are some unadventurous hat wearers like Adekunle Gold, who despite the trends would always hold on to that which makes them comfortable but for those who are more daring, you can cover your head with different types of hats because it is in season. Long vests have become a sort of luxurious coat. Everyone from Ebuka Obi Uchendu to Banky W has one or more. It’s a simple and elegant alternative to a jacket, plus it has a couture-like appeal which makes it worth investing in. These are underrated but not for long. Neck scarves not only help you keep warm but they look seriously cool. This gender-neutral trend is on the come up and we are here for it. Prints have made a space for themselves and are coming back with a bang this year. It doesn’t matter whether it is African print or not, complete print or mismatched, when a man wants to make a bold statement he does – print! Did you notice? Somewhere along the line turtlenecks were replaced by V-neck sweaters as the preferred piece for layering under a jacket in the cold zones. Well, this fashion staple is making its way back and we have a feeling they’ll catch on in a bigger way this year. 2018 saw the rise of a different type of jacket. Some call it a Kimono jacket others call it a belted jacket. We will stick to Kimono since it is a more accurate description of this jacket. They come in different styles and everyone from Denola Grey to Tobi Bakre have been seen in it. Denim is one of the most classic trends of all time. It really is timeless and has proven so. This is why we are not in the least bit surprised that it will be sticking around this new year. But this year there’s something different about the denim style; the colour of preference has been switched from dark to light-washed. Which of these trends are you looking to incorporate into your wardrobe first?